It’s uncharted territory for mini-desktops. We called Intel's last NUC the future of tiny desktops. And with this latest model, the Hades Canyon NUC, that's truer than ever. It has just about everything you'd want in a desktop, thanks to a single chip that houses Intel's eighth-generation Core i7 CPU and AMD's RX Vega M GPU. This is one of the first devices to use that hybrid processor, the product of a "frenemy" deal between Intel and AMD. It lives up to the meaning behind the NUC acronym: it's the "next unit of computing." Intel’s Hades Canyon NUC is everything we’ve ever wanted in a tiny desktop. It has enough graphical power to play just about any modern game and power VR headsets, but it’s small enough to take anywhere. And while it’s probably too expensive for most consumers, it still manages to push small form factor PCs into brand new territory. Be the first to review the NUC 8 VR? While its predecessor was already impressive, what makes the Hades Canyon NUC stand out is its combination of CPU and GPU power. It would have been unthinkable in a machine this size a few years ago, and it's still noteworthy today. Intel claims it's the smallest VR capable machine on the market, and we're inclined to believe them. Other compact VR desktop systems, like HP's, are significantly larger. This new model is more than double the size and weight of the previous Skull Canyon NUC. It retains a similar design though, with bright, multi-colored LEDs that light up the front and its prominent skull logo. The bigger frame is worth it, given that it's packing in around four times as much graphics power as before, and it makes room for even more ports. On the front, it features an SD card slot, two traditional USB 3.0 ports (one of which can charge devices when the NUC is off), an HDMI port, USB-C and a headphone jack. And it's even more impressive around the back, where there's four standard USB 3.0 ports, two Thunderbolt 3 capable USB-C connections, two mini displayports, two Ethernet jacks, an HDMI connection and another headphone jack with optical out. That's more connectivity than you'll see on any gaming laptop, and it rivals what you'd find on a typical desktop. Under the hood, which you can access easily by removing the top of the case, you've got easy access to all of the internal ports. That includes space for two M.2 SSDs, two DDR4 RAM slots (supporting up to 32GB), and two SATA connections. Like all of Intel's NUCs, it's a barebones box, so you'll have to buy your own RAM, storage and OS to get going. That's at least another $500 on top of the machine's $999 price tag, but it's within the price range of similar mini-desktops. Another thing worth mentioning: the NUC's power adapter is comically large. It's almost as heavy as the device itself. That makes sense, given how much power is going through this little box, but it hinders portability significantly. The Hades Canyon NUC didn't feel significantly different than the last model when it came to basic productivity tasks. But the difference was night and day once I loaded up some games. Doom 3 ran between 50 and 60 frames per second with High graphics settings in 1080p. Bumping the quality higher dipped the score to around 40FPS, but that was still impressive. It also had no trouble keeping up with a fast-paced game like Overwatch, where I saw between 60 and 90FPS in 1080p with Ultra settings. In comparison, I had to run the last NUC at 720p with low-quality graphics to make Overwatch playable. I was also blown away by how well it handled Hellblade: Senua's Sacrifice, a cinematic indie game that really taxes the GPU. Even with very high settings, it ran between 30 and 40 FPS, which is still playable. Knocking that down to high-quality graphics boosted performance to a smoother 50 to 60 FPS. 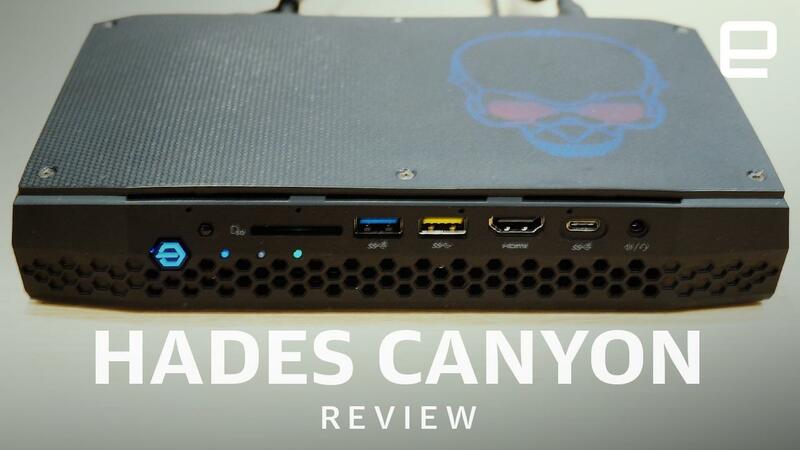 Overall, the Hades Canyon NUC proved to be a capable 1080p gaming machine. And just as Intel claimed, it's a solid VR rig. I had no trouble hooking up the Oculus Rift's sensors and headset, thanks to its many ports. And games like Superhot, Duck Season, and Serious Sam VR ran flawlessly. There wasn't any noticeable lag or slowdown, which I sometimes see with low-end VR machines. The Hades Canyon NUC is three times faster than the Skull Canyon NUC in the 3DMark Skydiver benchmark, and I saw similar results in the older 3DMark 11 tests. It was only slightly faster when it came to productivity tests in PCMark 7 and 8, which shows the leap between Intel's 6th and 8th generation CPUs isn't nearly as huge as the graphical jump. On top of being a beast at gaming, the Hades Canyon NUC manages to keep everything cool as well. The CPU and GPU hovered at a safe 55c as I was gaming, reaching up to 70c during demanding sequences. That's mostly due to the new closed-loop liquid cooler, which also helps to keep fan noise down. It makes the NUC a great option for a home theater/PC gaming machine, but be aware that it doesn't support YouTube HDR or 4K Blu-ray playback. As Anandtech reports, the AMD GPU doesn't support YouTube's VP9 codec, and it doesn't meet the standards required for playing 4K Blu-ray securely. There's also a $799 Hades Canyon NUC model, but it runs the slower Core i7-8705G chip, and it's not powerful enough to run VR. If you're going down this path, it's worth spending the extra $200 for the faster and more flexible hardware. As for other options, there are also larger mini-desktops like Zotac's Zboxes, which pack even more powerful graphics. Finally, Intel has a NUC that'll satisfy tinkerers and gamers alike. It's the sort of machine you could move around easily, especially if you prefer to game with a large desktop monitor instead of a small laptop display. While the Hades Canyon NUC is more of an experiment, than a mainstream consumer product, it's still groundbreaking. We've never seen such power in something so small. It's a sign that desktop computing is going to look very different in the next few years.